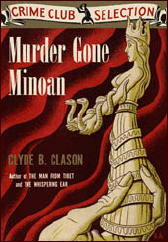 » Archived Review: CLYDE B. CLASON – Murder Gone Minoan. 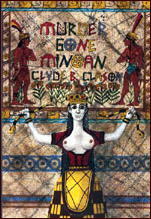 Archived Review: CLYDE B. CLASON – Murder Gone Minoan. Rue Morgue Press; trade paperback, 2003. Original hardcover edition: Doubleday Crime Club, 1939. Hardcover reprint: Sun Dial Press, 1940. Checking on www.abebooks.com just a few minutes ago, I found only one copy of the Crime Club edition for sale: Near Fine in a Near Fine jacket. Price: a mere $250.00. Further searching revealed a few other copies on other venues, one being a former library copy with no jacket. Price: a much more reasonable $35.00. Only one thing is lacking, before I continue, and that is the original cover art, which as I recall was by Boris Artzybasheff. That gentleman no longer being available (or affordable) a fine piece of work by Rob Pudim was used in his stead. To my eye it’s a bit cluttered, but it Does Catch the Eye. Clason’s series detective is an eminent Roman historian named Theocritus Lucius Westborough — Westborough for short — who also has earned a well-deserved reputation as a private investigator on the side. If this book is an example — which from my point of view it has to be, at least for the moment, since if I ever read an earlier book in the series, it was long ago and long forgotten — Westborough’s adventures are copiously filled with well-researched lore of ancient times, interspersed with mini-lectures on the same. I’m jumping the gun here, but it’s Westborough’s knowledge of ancient history that helps crack a killer’s alibi — which is not quite fair to the reader not recently tutored in such matters — such as myself, I have to admit — but it’s a sizable step above nabbing a villain who reveals himself because he’s not aware that buildings do not have thirteenth floors, for example. Just in passing. There is a deliberate misstatement on my part that is not quite correct in the last sentence of the previous paragraph, but if I were to speak more clearly, I would be revealing more of what Clason had up his sleeve than I should. This, the seventh of ten cases Westborough is on record as having solved, takes place on an isolated island off the southern California shore, where first a valuable artifact is stolen — and Westborough called in — and then murder, when a missing butler is later found dead. The owner of the island, a rich Greek businessman named Paphlagloss, is fascinated with the ancient Minoan culture, pre-historic Cretans whose civilization arose and fell even before the ancient Greeks, and his mansion is filled with valuable relics, artwork and jewels. It is just the right place for skulduggery to be done, and with only a handful of suspects, one of whom is responsible for doing the dugging, it’s a perfect setting for a mystery. Another of Clason’s strengths is in his characters and their dialogue. To my ears, the lengthy reports of letters and verbatim interviews of suspects are close to perfect. Other parts of the tale are excellent, while others, contrarily, are pure fuddle-muddle. “You are very wise!” she exclaimed. While it’s great to have this small gem of the Golden Age of Mysteries back again in print, I also have to suggest that it didn’t then, and it doesn’t now, have the staying power of one by a Queen, a Christie, or a John Dickson Carr. Even so, and within its limitations, Murder Gone Minoan is a gem in its own right, and no, they don’t write them like this anymore. [UPDATE] 07-16-09. 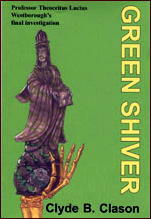 Rue Morgue Press has now published four of the ten Clason-Westborough mysteries: Dragon’s Cave, Green Shiver, Murder Gone Minoan, and Poison Jasmine. I don’t know whether the fact that these are also the last four is significant or not. I’d like to think that they’d eventually do all ten. I’ve known Tom and Enid Schantz since the Aspen Bookstore days, and they have superb taste in mysteries. If you haven’t read one check out some of Glyn Carr’s Abercrombie Lewker novels they are reprinting. The mountain climbing actor sleuth is fairly entertaining. They also have several of Kelly Roos books available as well as three of the funniest hard boiled mysteries ever written featuring Norbert Davis Doan and Carstairs — the latter a pedigreed Great Dane less than impressed with being partnered with private eye Doan. Sally in the Alley is a masterpiece — and not just the title. James Norman’s hard to find Murder Chop Chop is also available, the first adventure of his half-Mexican sleuth General Manuel Quiroga, who does his detecting for a Chinese warlord in 1930’s China. Has anyone ever read The Purple Parrot? I have a copy of this but have not read yet. Maybe somebody else can respond more positively. Given what I know of your reading likes and dislikes, Curt, I think you’d like Clason. If you do read THE PURPLE PARROT, maybe you’ll report back on it here?